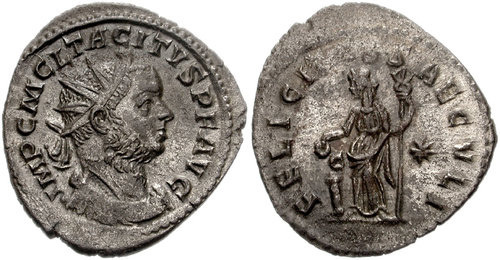 M. Claudius Tacitus was elected Emperor by the Senate after the death of Aurelian, the army having requested the Senate to nominate a successor to the imperial throne. He died either at Tarsus or at Tyana, about the 9th of April, 276. Obverse: IMP C CL TACITVS AVG, Radiate, draped and cuirassed bust right. Reverse: AEQVITAS AVG, Aequitas standing left, holding scales in right hand, cornucopia in left. Obverse: IMP C M CL TACITVS P F AVG, Radiate, draped and cuirassed bust right. Reverse: FELICITAS SAECVLI, Felicitas standing left by altar, holding patera and long caduceus; C-star. Obverse: IMP CL TACITVS AVG, Radiate, draped and cuirassed bust right. Reverse: FELICITAS SAECVLI, Felicitas standing left, holding patera in right hand, caduceus in left, altar left; C-star. Obverse: IMP CL TACITVS AVG, Radiate, draped, and cuirassed bust right. Reverse: FIDES MILITVM, Fides standing facing, head left, holding signum in each hand; BA. Reverse: MARS VICTOR, Mars walking right, holding transverse spear in right hand, trophy over left shoulder; B-star. Reverse: MARS VICTOR, Mars walking right, holding transverse spear in right hand, trophy over left shoulder; star-II. Reverse: MARS VICTOR, Mars walking right, holding transverse spear in right hand, trophy over left shoulder; B-A.